Marmite is a spread that is tasty and very nutritious, great for breakfast or a snack. It is low in fats and sugars, but high in vitamins and minerals. Containing iron, folate, essential B vitamins plus many more minerals and vitamins making Marmite great for a healthy balanced diet. 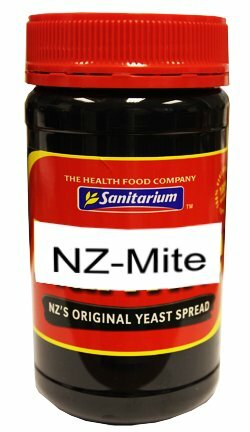 Please note that to avoid any trademark infringement we use the term NZ-Mite and re-label the jars for UK sale. However the product is still the same Sanitarium yeast extract you know and love from home! Love It, Don't Hate it. I'm a massive fan of the UK version, I would be, I'm a Brit, but I've loved the NZ version from first taste. Sweeter than UK Marmite but (IMHO) with a deeper flavour than Vegemite it's a winner! There's no point in buying the 250g size, you'll only be back for twice as much in half the time. Five stars are *not* enough!! If I can't get NZ Marmite I resort to the local UK version which pales in comparison and doesn't get used as often. I love this stuff and I'm not even Kiwi! A friend from NZ gave me some. I was curious and wondered if it would be the same as the British stuff (which I'm not a fan of) - it's actually a lot nicer and even worth the price difference. Buy a couple of 500g jars!